Wishing Torch | The best place to get your wishing torch lit. Lighting Wishing Torches since 2013! 2,347,071 Wishing Torches lit and counting! Get your wishing torch lit for free! 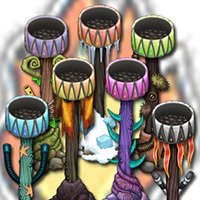 The wishing torch is the invaluable resource for breeding the rarest of all the monsters on the hit game My Singing Monsters. For every lit wishing torch that you have on the your island the chance of breeding a rare monster is increased. You can add up to 10 wishing torches on each island, but they are no good unless they are lit. There are a few ways you can light each one, either by spending 2 of your hard earned diamonds to light one torch for 24hrs, or 100 diamonds to light it forever. If you don't have any diamonds, or don't want to spend any of your diamonds you can still get your wishing torches lit for free. By getting your friends to visit your island they can light one torch for you for free per day. Sign up now and check below for some of the latest people wanting torches lit and lend a hand in breeding rare monsters. Even if you don't need any of your torches lit right now, help other My Singing Monsters players by putting a bit of light on their island. **Consider joining friends that have the same lighting habits as yourself. For example if you can only light a few times a week (which is absolutely fine with us) avoid becoming friends with someone who lights everyday as they will more than likely expect, or want, a return light everyday.